LANSING, Mich. – Following a two-game road trip, which saw the team claim its first victory in club history on March 30, Lansing Ignite FC will kick off against the Richmond Kickers in their first game at Cooley Law School Stadium in downtown Lansing (BUY TICKETS). LIFC earned its first victory against the Kickers in Week 1 of the League One regular season and will be looking to defeat them a second time after securing the 3-2 result in Virginia. The celebration of soccer in the Michigan capital will continue three days later, when LIFC faces off against the Michigan State Spartans in the Capital Cup (BUY TICKETS), presented by Sparrow. Visit one of our Official Pub Partners to watch the match. "We've been together now since mid-February, and this date has been building, so it's a great privilege for us to do this - professional soccer in Michigan for the first time in a long time," LIFC Head Coach Nate Miller said. "It's a huge opportunity and responsibility that our team carries, and we're ready for the challenge. The team has been preparing extremely well and is extremely excited for it." 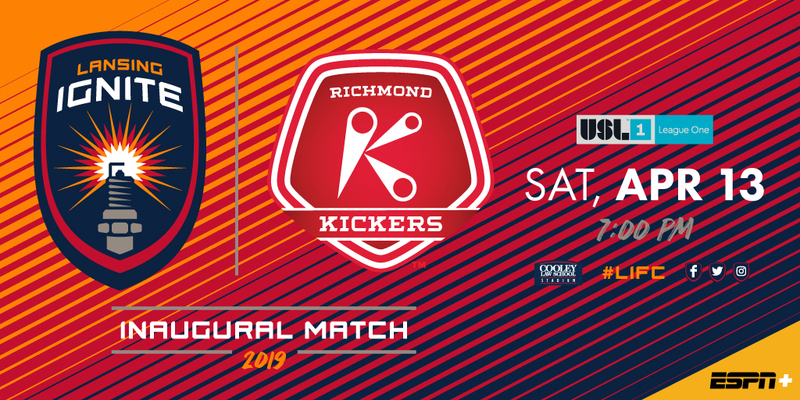 Now in their 27th year of existence, the Richmond Kickers compete at City Stadium, a venue the club has played at since 1995. The team has garnered numerous accomplishments over the years, including winning the Lamar Hunt U.S. Open Cup in 1995 and most recently finishing first in the 2013 USL Championship regular season. The club is led by Chairman Robert Ukrop, and the team is coached by former player David Bulow. LIFC is 1-1-0 in the USL League One regular season, defeating the Richmond Kickers 3-2 on March 30 before falling 2-1 to Greenville Triumph SC on April 6. Tumi Moshobane scored the first goal in club history against the Kickers on March 30. Xavier Gomez and Kevin Coiffic scored the second and third goals, respectively, in the team's first victory. Ricky Lopez-Espin scored the only LIFC goal in the team's game against Greenville on April 6. Tumi Moshobane, Richi Perez and Ricky Lopez-Espin are suspended from Saturday's match. Following their strong performances against Richmond on March 30, Xavier Gomez and Grant Stoneman were named to the USL League One Team of the Week for Week 1. Richmond is 0-1-1 this season after falling 3-2 to LIFC on March 30 and tying South Georgia Tormenta FC 0-0 on April 6.